Chris joined APN in March 2016 and was previously responsible for managing the Direct Property Funds business before the listing of APN Convenience Retail REIT. Chris has over 13 years of experience in direct real estate, funds and asset management, predominantly in the retail property space. 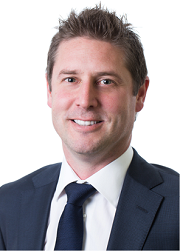 Prior to joining APN, Chris was with Vicinity Centres for over 10 years, where he held a number of senior roles including Head of their Unlisted Funds Management business (formerly known as Centro MCS Direct Property) where he was responsible for funds under management of $1.7 billion, comprising 75 properties, across a number of Australian, New Zealand and US unlisted property funds. More recently, he has been responsible for managing Vicinity Centres’ key joint venture partnerships. Chris holds a Bachelor of Business at Swinburne University and is also a Member of the Institute of Chartered Accountants.